Few DLP projectors manage to break the £2K barrier so we wondered how much of the format's quality would be preserved with this £1,900 model. At first glance, it seems that the savings have been made on its appearance. Its chunky plastic bulk is lined with grille slots and it's not something you would leave out accidentally to impress your visitors. But let's not make too much of its exterior when its beauty is intended to come from within. And breaking that surface rearwards is some indication of this potential in the form of an HDMI input and component video inputs along with a D-Sub PC interface, 12V trigger output, and the lower rent SD sockets. 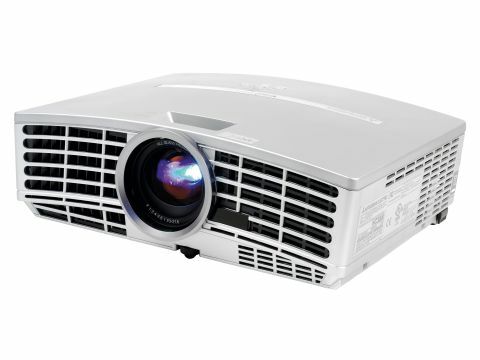 Native resolution is rated at 1,280 x 768 and it's accompanied by impressive sounding ratings: a 4,000:1 contrast ratio and 1,000 Lumens brightness. Its USP though is probably the BrilliantColour mode - an invention of the chip wizards at Texas Instruments. The 'pure' version is a chipset designed to improve colour tones when twinned with a colour wheel. That colour wheel isn't presented in this model - a standard Mitsubishi 6-segment, 4-speed version is used instead - so hopefully performance isn't too compromised. But there was plenty of good news when we powered up. For the first time, it didn't seem budget class. The chase scenes in King Kong were all the more engrossing as the HC3000 had little difficulty in chasing the action without smearing, whether it was the ant-like scurrying of the fleeing humans or the lurching mass of the dinosaurs. In the shadowlands of both the New York theatre and the island caves and burrows, we were also pleasantly surprised to find no evidence of grain pursuing the outlines of either the various open-mouthed members of the audience or scurrying islanders respectively. Colours too are much as they should be with little deviation from the cinematographer's plan, and reproduced with a subtlety rarely found for this price. Despite the good black levels, the mid tones were displayed fully without any one impinging on the other. With all these compliments, there has to be a catch and it comes in rainbow effect and its appearance is noticeable even by budget standards. 'Fine' detail too is a misnomer. Fine, as in OK, but it looks inferior to similarly priced LCDs. All in all, if DLP's your bag, the HC3000 makes a good attempt at bringing a premium format within the budgets of more people, and for those who thought the technology was out of their range, it's well worth a look.